From Siem Reap, we travelled to Phnom Phen - this involved an 8 (which was closer to 9) hour bus trip. 8 hours feels like nothing now! We got had an 8am pick up and spent most of the journey asleep but eventually arrived in PP around 5.30pm. 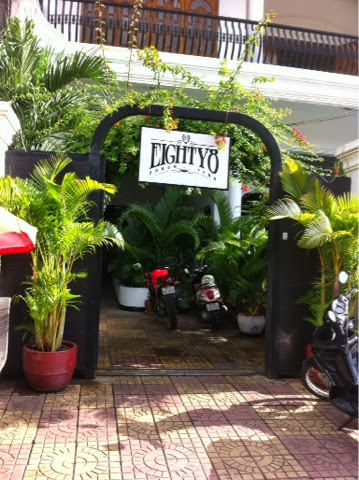 The bar man at Downtown Siem Reap Hostel had recommended 88 backpackers in Phnom Phen, which also happened to be the place our friends from DSR were also staying at. Now, apart from the killing fields and the genocide museum, there doesn't appear to be a great deal to do in PP so we decided on two nights here before heading to Sihanoukville to get the boat over to the hugely recommended Koh Rong. The first thing I noticed when we reached Phnom Phen was just how industrial it is around 15km out of the centre - rice factories, bio power factories, fishing lakes - it felt like the real deal; not touristy like Siem Reap. When we finally arrived at 88 backpackers we saw straight away it is such a nice hostel! Clean, newly decorated, modern furnishing, spacious rooms, friendly staff and great food (always a bonus/selling point with us!) it cost around $3-4 a night which is good for Cambodia. We've since looked at Vietnam hostels and they're all at least $3 more! That night we chilled in the hotel bar, had the best BLT baguette I've possibly ever had and had some drinks with the others. It's been nice to have a big group of us together for a week or so, and we've learnt how to place an Aussie drinking game which I can tell will crop up in the future! We headed to bed and had more of a lie in than anticipated. Today was going to be a tough day - a trip to Tuol Sleng prison and the killing fields. In the 70's the Khmer Rouge took over and inflicted mass killings on Cambodians and other nationalities residing in Cambodia. The most shocking thing is that this happened so recently that people in there 20's, like me, have parents that will have been born during the Khmer Rouge regime. And something even more disturbing, torture and killings like this, maybe not mass, but still, these things will being happening in the world somewhere to this day. The leader of the regimes slogan? 'Better to kill an innocent than spare an enemy' - this still makes me shiver. Pol Pots died under house arrest so received no real punishment for his crimes either! The day was as expected, really sad, eerie when we visited S-21 and read about the way the poor people were tortured. If you ever go to Cambodia and are in or near Phnom Phen, I really urge you to go and visit the genocide museum and killing fields and to learn about this bit of history. Yes, it is terribly sad but it was kept under wraps for so long and some of the remaining Khmer Rouge members are still on trial regarding the mass genocide and their actions against humanity. As you can appreciate, the rest of the day was a bit quiet. It's hard to know what to say after hearing of such things. That evening we headed to the weekend night market near the waterfront. 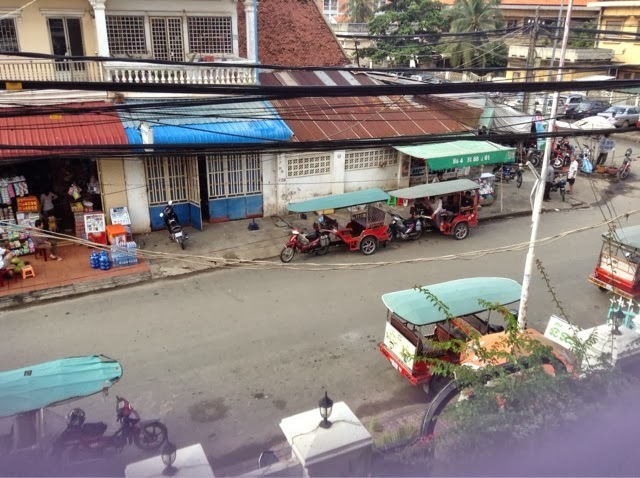 When we were in Siem Reap we had been told that Phnom Phen was 'really dangerous' at the moment because of protests but we saw none of this; if anything, all we saw were a lot of police on the corners of the street - a sign that whatever had been going on was under control. The waterfront was a 'to avoid' area but as far as we could tell after driving by in our tuk tuk, we would be fine. The night market was a real experience! 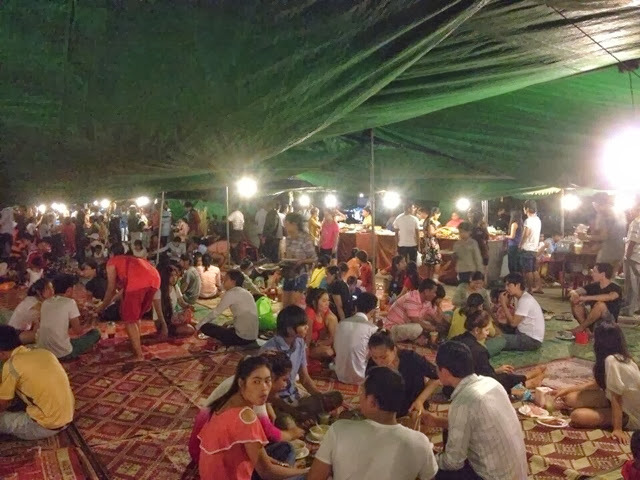 It was absolutely bursting at the seams with people, 90% Cambodians and the rest tourists. Us being us, we headed to the food area first; a matted area surrounded by local food stalls - barbecued meats, authentic Asian foods; all you had to do was grab a plastic basket from one stall and start filling it up. 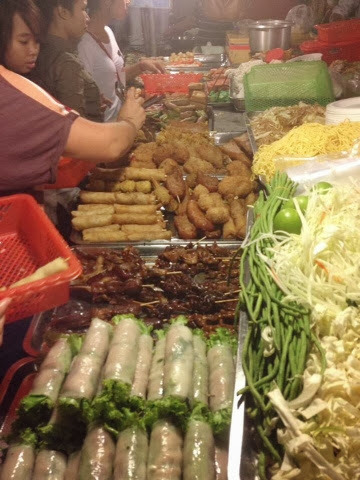 I had three meat skewers, spring rolls, breaded shrimp, won tons, toasted baguette and various other things and it cost me no more than $4, which is dirt cheap and I was stuffed! After the food, we headed towards the other stalls selling clothes, handmade gifts, bags, you name it they had it! It was actually refreshing to go to a local market and see how the Cambodians do it; we've been to so many tourist markets since we've been in SE Asia that they've all blended into one. We got a few bits and after a couple of hours there, headed back to the hostel. With a 7.30am pick up to take us via Sihanoukville to Koh Rong, we caught up with friends and family, booked accommodation and read up on some bits and bobs for Vietnam and Bali. Although I preferred Siem Reap hands down, Phnom Phen is well worth a visit for a little bit of history and a less touristy experience of Cambodia and the Cambodian people.